Why There Was No Bunk "J"
...and why was there no "J" bunk? It's interesting to note that all of the Indian names are of tribes, except for Geronimo, which, of course, was the name of an Indian chief, who happened to be an Apache. The fact that none of the bunks were cool cool cool named with a "J" is probably because they couldn't think of any Indian names that begin with a "J." In reality, there only a few that begin with "J." But they didn't have the advantage of the Internet in those days to do the research. Don't be silly. There is no cabin "J" because of the 10 boys killed there by the Collegeville killer. 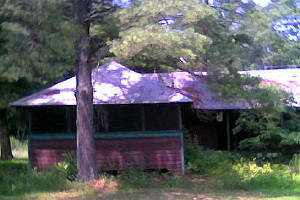 The cabin burnt down and was never replaced. That was the story (legend) I was told by Steve Funt, but Bunk Jericho, in addition to being burnt down, was rebuilt, and then blown down by hurricane force winds!